As a follow-up to WL100/70, here’s the final section (in translation) of a huge article on Lutosławski’s Concerto for Orchestra. Its author was Zofia Lissa, the dominant presence in Polish musical policy during the post-war decade. She was a musicologist with an early specialism in film, but she is best known for her Marxist ideology and her role in shaping Polish musical thought during the period of socialist realism. 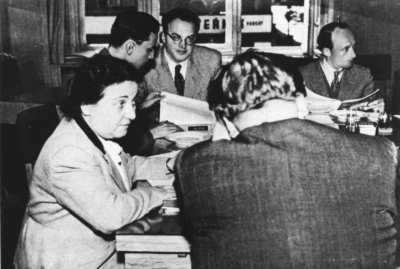 Zofia Lissa (left), Andrzej Panufnik (immediately behind) and Witold Lutosławski (right) in Prague, 1950. 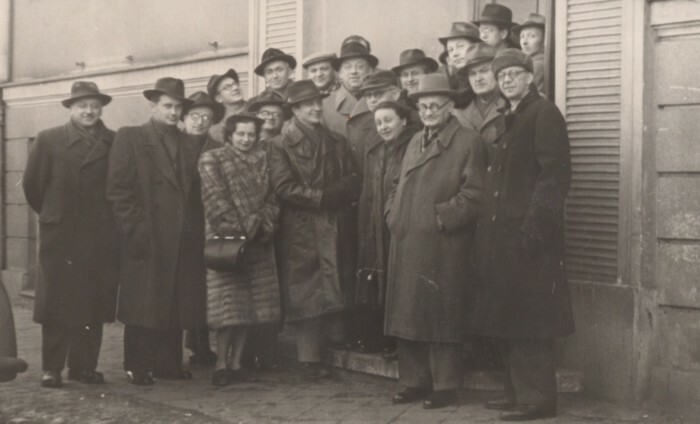 A visit by the Polish Composers’ Union to Poznań, 1953. Zofia Lissa (front row, third from right), Witold Lutosławski (top right, looking characteristically wary). As might be expected, the analytical aspects of Lissa’s article were embedded in a view of music that promoted a socialist-realist view of the function of the arts in communist society. The article is far too long to reproduce in a post. Here instead is the concluding section, translated by Michał Kubicki and myself a few years ago, but never published. It gives a flavour of the musical environment of the time. It is a curious, transitional mix between the defensive and the confessional, because by 1956 – two years after the premiere of the Concerto for Orchestra – Polish music and musicology, and Lissa herself, were rapidly changing their tune as the barriers to Western music and its aesthetics were brought down. If the problem of mastery in contemporary Polish music has not to date been taken up by our musicology, it is mainly because there have in fact been few pieces which have borne the hallmarks of mastery. It seems to me that it would not be an expression of ‘hagiography’ if we were to acknowledge this mastery in Lutosławski’s Concerto. Mastery in diversity and originality, in the innovative character of its expressive devices; mastery in the economic way of employing them, in the perfect coordination of these devices with a form that is both new and his own in conception; mastery in the new treatment of folklore, in the synthesis of ‘old’ and ‘new’. In the Concerto Lutosławski has given yet more proof that he has his own style of utterance; the influence of this style can already be detected in works by other composers (such as Baird’s Lyric Suite ). Our remarks about Lutosławski’s Concerto would not be complete, however, if we did not pose the question: what is the role of this piece in Polish music of the [post-war] decade. What is the relationship of the work to the various postulates which our life has thrust forward, to the issues which have preoccupied this period? We can only become fully aware of the significance of a musical piece, having exhausted the analytical aspect connected with the description and explanation of its shape, if we are able to answer this question. And there is another one: what is the role of this piece, when it comes to the composer and the individual development of his talent? Let us start with an answer to the latter question. Writing at the end of 1951 and the beginning of 1952 about Little Suite and [Silesian] Triptych , I saw in them the first attempts at a synthesis of two strands in the composer’s music: that of monumental works, stemming from the premises of the inter-war period, difficult, long and painstakingly elaborated and by no means easy for the average listener to grasp. Here belonged the First Symphony, Symphonic Variations as well as the later Overture [for Strings]. The second creative strand focused on charming miniatures, wonderfully carved and strongly linked to folklore, thanks to which Lutosławski’s music managed to penetrate through to fairly broad layers of the listening public. Folk Melodies for piano, Children’s Songs set to Tuwim’s verse, A Straw Chain, Bucolics and Dance Preludes for clarinet and piano – these are the main works within this strand. Little Suite and Silesian Triptych were the harbingers of the merger of these two strands in Lutosławski’s music. On the basis of the analysis of these two works I tried to account for processes which were to be fully confirmed by the Concerto for Orchestra itself. If those two works constituted a preparatory stage for this synthesis, the Concerto was its full and ultimate realisation. In it met the experiences and attempts of Lutosławski’s previous development, realised both in symphonic forms and in the other field of his creative activities – the miniatures. It is only on the basis of these activities, in which folklore was the starting point for the conception, material and form, that the composer’s new attitude to folklore, as currently realised in the Concerto, could be born. It is only on the basis of an organic merger of one’s own reservoir of musical ideas with folk ideas that the kind of unity that can be observed in the Concerto could be brought into being. This is the characteristic blending of folklore into monumental form, whose concept, however, is the [composer’s] own, individual concept, as in the First Symphony or the Symphonic Variations, and not a concept stemming from non-musical ideas, connected with the people [lud], as in Little Suite or Triptych. One may have some doubts whether it is valid to employ folkloristic material without linking the concept of the work with a specific content derived from ideas about the people, with the representation of folk scenes. Indeed, in the majority of pieces using folkloristic material from one’s own or from a foreign country, the folklore was to serve just these aims. In the Concerto it fulfils a different function, even though it surely contributes to the creation of the ‘atmosphere’ of Polishness in the piece. Under no circumstances does it perform functions that are descriptive, functions that specify aspects relating to content. The same, albeit less consistent manner of employing folkloristic material can also be seen in Szabelski’s Third Symphony . Lutosławski’s Concerto links together two strands of his music and two musical worlds which in the composer’s imagination have up to now proceeded, as it were, independently of each other, contained in pieces which were somewhat different in style and format. In this sense the Concerto should be regarded as a crucial moment in Lutosławski’s compositional career. It should be considered a work of special significance from yet another point of view: the quality of its resources, the perfection/carving of its details, the frugality of their use, the originality of the ideas and the purity of the distinctly national style – all this had also been noticeable in Lutosławski’s small forms, including Little Suite and Triptych. But the same discipline, inventiveness, originality and stylistic accuracy in such a monumental form as the Concerto, the same national countenance, albeit differently realised, already testify to the full maturity of compositional craft, to the crystallisation of an individual style, to the composer’s mature mastery. We should look at Lutosławski’s Concerto from yet another perspective, from the perspective of the development of the totality of our music during the ten years of People’s Poland, the postulates put forward during that period, undoubtedly correct in their essence, but often vulgarised by numerous scribblers on music or civil servants, not always musical experts. To put the issue unambiguously straight away: Lutosławski does not follow the slogans which call – at the stage of a simplified understanding of the essence of socialist realism – for a rejection of 20th-century technical devices, for a return to romantic-neoromantic means; if there is a clarification of his style, it is as a result of the tremendous discipline of construction, the deep reflection and the frugality in the choice of resources and not in order to return to the stylistic traits of past periods. At a time when a return to the style of the 19th century was postulated, he managed to be forthright but not academic, accessible but persuasive, with a new type of simplicity, without at the same time rejecting the technical achievements of the inter-war period, achievements which seemed to him to be indispensable for his own compositional craft. Nor did Lutosławski move in his symphonic pieces towards programme music. This does not mean at all that he went the way of constructivism, that he renounced expressive content in favour of technical values. On the contrary, turning to the form of the song, namely the linking of music with text, shows that his precise goal was the most adequate rendition of content – expression. The use in Triptych of the textual and vocal aspect confirms that [Lutosławski’s] attitude towards the realisation of content encompassed even symphonic forms. The same ‘concrete nature’ of ideas, this time relating to dance, lies at the basis of Little Suite. If we say that Lutosławski avoided an illustrative programmatic approach, it does not mean that his attitude was anti-expression. Besides, we must stress here that in this respect he assumed an attitude practically like that of the whole circle of Polish composers in the [post-war] decade, among whom the slogan of the programmatic in the context of symphonic music met with a very weak response. Apart from Woytowicz’s Warsaw Symphony, and also Serocki’s Second Symphony, which involved choirs (meaning that the content was manifested verbally), this postulate was realised rather feebly. One of the decade’s slogans, however, was readily accepted by Lutosławski and realised out of his own inner need: the slogan of crystallising a new, contemporary national style. Lutosławski brings this out in his entire cycle of ‘miniatures’, to a larger extent in Little Suite and Triptych. And in a new way in the Concerto. Lutosławski’s music is stylistically homogenous, be it a small prelude for piano, an orchestral piece, a children’s song or a monumental symphonic form – all his works are an expression of noble beauty, a beauty created by a man from our epoch, our milieu, our generation. In this sense Lutosławski’s music is the music of our time, enriching the culture of our country, belonging to the culture and ideological world of our society, despite the fact that is does not speak in concrete and explicit terms either about the revolution that we are living through or about the goals which we set ourselves. In this sense, too, Lutosławski’s Concerto belongs to the first decade of People’s Poland, even though, with its programme, textual content or selected genre, it does not directly support its ideology, does not immediately contribute to the struggle which is the axis of this decade. It is music which fights for the enrichment of the inner life of the Polish listener, for the development of Polish musical culture, for a new national style for our time. And this is a great deal. To put forward the issue once again clearly and openly: Lutosławski’s Concerto for Orchestra does not belong to easy pieces addressed to the unprepared listener. It is not possible, leaving the concert hall after its performance, to hum or whistle the themes; which would be tantamount to trivialising and vulgarising the practical criteria of ‘musical realism’ for everyday use. On the contrary, this work is evidently geared to the listener who is already prepared, versed and accustomed to the norms of 20th–century music; a listener whose musical imagination is not confined to the categories of romanticism or neo-romanticism. Is Lutosławski’s Concerto, therefore, a manifestation of an ‘elitist’ attitude, something which has so far been the most serious accusation levelled against our composers during the decade? It is impossible to answer this question without throwing light on the key issue of our cultural revolution in the field of music. The fact that the need for such music was rightly and continues to be rightly propounded – music that would educate, raise those listeners who are unfamiliar with music to a higher level of their ‘musical consciousness’ – should not at all be understood in such a manner as if all music by contemporary composers was to be directed to this type of addressee. Millions of copies of Falski’s primer  hardly abolish scientific research or hinder the publication of studies addressed to several thousand specialists. Are we therefore returning to an old concept: one kind of music ‘for specialists’ and another kind of music ‘for lesser mortals’? Definitely not. We simply believe that the manifold varieties of ‘musical consciousness’ in our contemporary society, which are a remnant of the class split in the field of cultural needs, must have fairly different musical needs and that there must be fairly different means through which these needs are satisfied. Under no circumstances can this fact be the reason why contemporary Polish composers should give up their right to look for new devices which correspond to what they want to express with their music today. One thing is certain and was certain when attempts were made (i.e. when our administration attempted) to classify this as ‘formalist inclinations’: devices adequate to the expressive needs of contemporary composers can in no way be the same as those for composers 100 or 50 years ago, even today, when it is precisely these ‘century-old’ devices which constitute the foundation of the listening habits of the broad masses of end-users in our country. One of the most serious mistakes committed by many of those who express their opinion about music (in many cases, unfortunately, non-musicians) was that they postulated a uniform front for the music of our epoch, forgetting about the highly heterogenous needs of our society and its perceptive abilities. But – let us return to the already quoted statement by Marx – ‘for the non-musical [i.e. unhearing, unprepared – Z.L.] ear even the most beautiful music makes no sense’. A peculiar ‘Berkeleyism’ has been utilised by us [in Poland] in day-to-day practice: travestying Berkeley’s famous thesis – esse est percipi – it was believed that it is only the music that an opinion-former can grasp, understand and sense which is good, correct, needed by our society and, what is more, realistic. Everything else was just ‘formalism’. One’s own, subjective, often very limited categories of musical ideas were objectivised and were merely given labels of ‘commonly binding norms’. Music that was personally inaccessible, difficult, elusive, was thoroughly mixed up with objective music standing in the enemy camp. The difficulties of semantic criteria in reference to music rendered this misunderstanding even greater and deeper. Of course, nobody negates here the uniformity of musical culture conceived as a service to our society which is moving towards socialism; uniformity in the sense of the utterance of the man of our time, of our milieu, the man who senses our reality. But one cannot also fail to notice the diversity of functions which this music has to fulfil today in our society, the diversity of needs stemming from our cultural heritage, burdened of course by all the negative features of a society split by class. The musical listener in People’s Poland continues to be highly diversified as regards the categories of musical thinking, which bears deep traces of the class stratification in which Polish musical culture had been shaped for centuries. The scope of musical needs here is very broad, while listening habits, which listeners use in the perception of music, are historically very diversified. We have today many music lovers who are genuinely in love with music and yet they do not go beyond Bach or Beethoven, for whom even the world of Debussy and Ravel is already alien to the ear, who have to struggle through Szymanowski as if it was an aural jungle, not to speak yet of the ‘sound worlds’ of Honegger or… Lutosławski. What in Lutosławski’s miniatures was still ‘digestible’ for them becomes sonic chaos in the Concerto for Orchestra. They reject from the position of their listening habits (wrongly objectivised as the only correct aural norms) everything which goes beyond their subjective limits of reception. This conflict has, incidentally, been constant in the history of music. The struggle for new expressive devices on the one hand and on the other the struggle against them for the sake of the devices that are already well known and mastered by the ‘ear’ of a given generation appears in almost every epoch, in every generation, only to cede victory, of course, to a ‘new’ music which creates in the listeners the aural habits that are specific to it. Ars nova by Philippe de Vitry (14th cent. ), the tract which gave the name to an entire period in music, is already proof of this. It is clear that this struggle takes on a new shape in periods when social revolution contributes to an intense broadening of the range of music listeners. The backwardness in the musical appreciation of the classes newly emerging on the historical scene is far bigger, because indeed objectively they depend on class conditions which hinder access to the manifestations of culture. At such historical moments, the stratification of musical needs manifests itself much more strongly and different ‘musical consciousnesses’ oppose one another far more acutely. The pressure of the needs of new listeners mounts and it is clear that in the first stage they have to reject the more complex devices which do not get through to them. Another thing is that they also reject the philosophical point of view – Weltbild – which is often hidden beneath the elitism and sublimation of devices. The whole picture of the development of Soviet music to date, with its successive variations – of RAPM , of ASM , with the breakthroughs of 1937 and 1948, is precisely a reflection of this fundamental historical and class conflict. Admittedly, these differences in ‘musical consciousness’ do not always have their own class conditioning, but nevertheless this factor is the basis of objective conflict. This conflict was also present in the music of our decade. A simplified, anti-psychological and anti-historical approach to the issue led to a situation where the struggle for a new content in the music of the decade became a struggle against innovative devices. The struggle for access to musical culture for the whole nation was for a certain period identified (falsely) with giving up the creative quest. The need to conform to the tastes of the broad masses was proclaimed. But when dealing with a society as musically neglected as ours (if only in comparison with our closest neighbours to the East and West), as was but natural, a postulate was made to level down , a postulate against which in the 1920s the then Soviet culture minister, Lunacharsky, was still warning. The postulate for a uniform trend in such conditions was definitely premature. The time for a fully uniform trend and homogenous devices will come perhaps in a communist society, in which differences in ‘musical consciousness’ will no longer be a result of the ability or inability to have access to musical culture but will be confined solely to individual ‘realisations’, which doubtless will not disappear at that time either. It was the anticipation of some sort of imaginary, uniform ‘musical consciousness’ of our society already now, 10 years after the revolution, that was the source of many simplifications in our cultural policy in the field of music. Attempts were made to condemn works, which – just like those by Lutosławski – unquestionably remain inaccessible to the whole nation today but will become a nourishment for the broad masses when these masses eradicate their musical illiteracy just as they had already eradicated their educational illiteracy. Indeed – what is needed today are works which will help eradicate this illiteracy, which in a considered way will fulfil educational functions. Lutosławski’s Concerto is not capable of performing such a role. And we have to admit that there are too few pieces in our music output of the last decade which deliberately undertook such functions. The great sacrifice of Soviet music – which for over 30 years indeed placed substantial limits on its innovatory explorations in order to give the entire nation the simple nourishment on which its musical categories could develop – was not in vain. Today, Soviet music proceeds in its fullness along new roads; it calls in the resonant voice of its most outstanding composers for the right to innovation. But it has behind it over 35 years of educating its society. The difficulties of our music stem from the fact that even though it fights, justly and sometimes against the department of culture, for the right to innovation, it has not yet educated its own society in such a way that it could become its end-user. At any rate – alongside works playing an educational function, we need innovative pieces, just like Lutosławski’s Concerto, pieces which, inaccessible to the masses today, will be accessible to them, will be a document of today for when the level of receptivity of the masses increases. The theory of a ‘uniform trend’ will by no means resolve this conflict. If despite this anyone wants to employ such simplifying notions like ‘elitism’ and ‘universality’, it should be clearly stated that Lutosławski’s Concerto belongs rather to the first group. Not because it expresses some sort of ultra-subjective content, or turns its back on its own society, or is alien to our epoch and our line of development, but because it is difficult, because it does not employ hackneyed devices, because it is – within the framework of the technical achievements of our music – innovative. These aspects assign it a special place in the music of our decade. As it happens, this Concerto does not depart in the least either from the general line of the development of music or from the individual line of the development of Lutosławski’s style. It is inventive but not experimental, it is innovative but never breaks with tradition. On the contrary, we may notice in it a peculiar though organic blend of such traditions as the Baroque, Romanticism, Impressionism and elements of the style of the inter-war period, presented in a characteristic, individual synthesis of an evidently Polish character. Lutosławski simply derives from the closer and more distant traditions what he needs in order to realise his own concept. This manner of drawing from traditions, be they close or distant in terms of time or geographical location, has always existed in music and is hardly deserving of condemnation. This is just a way and form of blending national styles with the norms of their own epochs, norms which are international. This is at the same time a manifestation of the continuity of transformations in the development of musical styles. Lutosławski is to a high degree national and at the same time European, and what strikes the listener above all is what is already the composer’s own, individual face, his original, crystallised style. This seems to be the highest praise that can be given to a composer during his lifetime: his own individual style which is simultaneously a modern style, i.e. the style of his own epoch and a national style. It is precisely such individual achievements that should be recognised as the development of a national style, as a new contribution to the tradition of a given national musical culture. About Lutosławski’s music we can already say today that it is and will be a lasting contribution to 20th-century Polish musical culture. Z. Lissa, ‘Mała suita i Tryptyk Witolda Lutos’awskiego’, Muzyka 5-6 (1952), pp.7-56. Marian Falski’s Primer was used in Polish primary schools for several decades. RAPM: Revolutionary Association of Proletarian Musicians, emerged from the Proletkult organisation around 1924, fully developed around 1928, dissolved in 1932. ASM: Association of Contemporary Music, equivalent of the Society for Contemporary Music, active around 1934, mainly in Leningrad. Here Lissa uses the Russian-based phrase, ‘urawnilovka w dol‘.